I had heard correctly. I nodded. I nodded more vigorously. My brother and I love each other, but we’ve crossed toy pistols. Light, the lecturer continued, behaves like BBs under certain conditions. Under other conditions, light behaves differently. Different behaviors correspond to different species of light. Some species, we can approximate with classical (nonquantum*) physics. Some species, we can’t. Kids begged less for BB guns, in my experience, than for water guns. I grew up in Florida, where swimming season stretches from April till September. To reload a BB gun, you have to fetch spent BBs. But, toting a Supersoaker, you swim in ammunition. Water guns brought to mind water waves, which resemble a species of classical light. If BBs resemble photons, I mused, what about Supersoaker sprays? Water balloons? I resolved to draw as many parallels as I could between species of light and childhood weapons. Under scrutiny, the Supersoaker analogy held little water (sorry). A Supersoaker releases water in a stream, rather than in a coherent wave. By coherent, I mean that the wave has a well-defined wavelength: The distance from the first crest to the second equals the distance from the second to the third, and so on. I can’t even identify crests in the Supersoaker photo below. Maybe Supersoaker sprays resemble incoherent light? Incoherent light is a mixture of waves of all different wavelengths. Classical physics approximates incoherent light, examples of which include sunlight. If you tease apart sunlight into coherent components, you’ll find waves with short wavelengths (such as ultraviolet rays), waves with medium (such as light we can see), and waves with long (such as microwaves). You can’t ascribe just one wavelength to incoherent light, just as I seemed unable to ascribe a wavelength to Supersoaker sprays. But Supersoaker sprays differ from incoherent light in other respects. I’d expect triggers, for instance, to introduce nonlinearity into the spray’s dynamics. Readers who know more than I about fluid mechanics can correct me. Though far-reaching and forceful, Supersoakers weigh down combatants and are difficult to hide. If you need ammunition small enough for a sneak attack, I recommend water balloons. 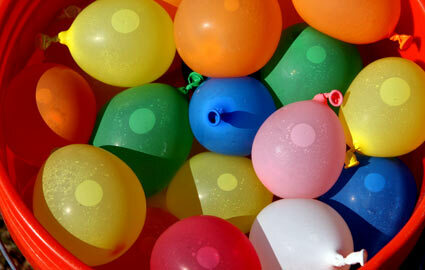 Water balloons resemble squeezed states, which form a quantum class of light related to the Uncertainty Principle. Neither uncertainty, for example, can equal zero. Heisenberg’s proposal has evolved into more rigorous, more general forms. But the story remains familiar: The lesser the “spread in the possible values” of some property (like position), the greater the “spread in the possible values” of another property (like momentum). 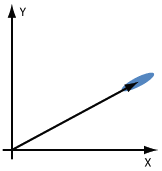 Imagine plotting the possible positions along a graph’s horizontal axis and the possible momenta along the vertical. The points that could characterize our quantum system form a blob of area ћ/2. Doesn’t the blob resemble a water balloon? Imagine squeezing a water balloon along one direction. The balloon bulges out along another. Now, imagine squeezing most of the quantum uncertainty along one direction in the diagram. You’ve depicted a squeezed state. Not all childhood weapons contain water or BBs, and not all states of light contain photons. ** A vacuum is a state that consists of zero photons. Classical physics suggests that the vacuum is empty and lacks energy. A sliver of energy, called zero-point energy, pervades each quantum vacuum. The Uncertainty Principle offers one reason why. The vacuum reminds me of the silent treatment. Silence sounds empty, but it can harbor malevolence as quantum vacua harbor energy. Middle-school outcasts beware zero-point malice. Retreating up Memory Lane, I ran out of analogies between classes of light and childhood weapons. Children play with lasers (with laser pointers and laser-tag guns), and lasers emit (approximately) coherent light. But laser light’s resemblance to laser light doesn’t count as an analogy. The class of incoherent light includes thermal states. (Non-experts, I’m about to spew jargon. If you have the energy, I recommend Googling the italicized terms. If you haven’t, feel free to skip to the next paragraph.) Physicists model much of the natural world with thermal states. To whichever readers identify childhood weapons that resemble them, I offer ten points. I offer 20 for mimicry of solitons or solitary waves, and 25 for that of parametric down-conversion or photon antibunching. But if sunshine and Supersoakers lure you away from your laptop, I can’t object. Happy summer. With thanks to Bassam Helou for corrections and discussions. *Pardon my simplifying inaccuracy. Some nonquantum physics is nonclassical. **More precisely, not all Fock states correspond to particle numbers . Alternatively: Not all states of light correspond to positive expectation values of the particle-number operator . Some references would be very welcome … perhaps even a follow-on post? Does this refer to Unruh-type effects? Exotic media with highly nonlinear dispersion relations? Charge stripes in high-temperature superconductors? Black hole firewalls? And what do fluctuation-dissipation relations have to say, in regard to the exotic currents that must be the sources/sinks of these exotic states? ps Thank you Nicole, for your admirable work in sustaining this wonderful quantum weblog. Thank you for your comment. Nothing so exotic in mind — apologies about the disappointment. The vacuum is the Fock state in which the system contains n = 0 photons. Good call! Now, how would we reconcile (1) the modeling of both photons and solitons with BBs with (2) the difference between photons and solitons? Hmm, a valid point, it’s kind of tricky to include both without destroying the analogy. Thanks for your suggestion! Generalization has its role in physics, no? We can generalize to childhood weapons and toys. An ingenious toy-like application of parametric down-conversion dynamics is set forth in US Patent 2815488, “Non-linear capacitance or inductance switching, amplifying and memory organs”, issued posthumously in 1957 to it’s inventor … John von Neumann. Yes, universal Turing machines can be realized, elegantly, as networks of electromagnetic waves propagating between parametric converters. These devices were realized commercially (in Japan) as “parametron” computers, in an effort led by Eiichi Goto, who had independently conceived this invention. In the end, Moore’s law won out over physical elegance, in that transistors shrank more readily than parametrons.